Adaptalift Hyster Forklift Rentals & Sales have announced that the Hyster H16XM-6 will be launched on stand OS665, at the Queensland Mining & Engineering (QME) Exhibition, with their range of specialised materials handling equipment also set to feature. As first time exhibitors to QME, Adapatlift Hyster will showcase their extensive range of materials handling equipment, including the Hyster H16.00XM-6 with a fitted tyre handler attachment, in addition to the launch of the Hyster H16XM-6 forklift. 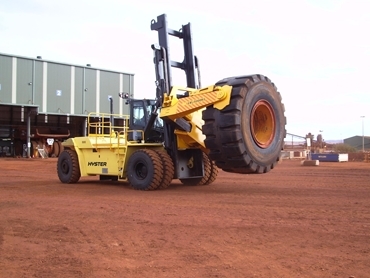 Adaptalift Hyster provides the mining sector with a premium range of highly durable and well-built equipment, whose load capacities ranging from 8 to 52 tonnes, with a wide range of attachment options also available. At QME 2014, Adaptalift Hyster will have a range of materials handling equipment on display, along with expert personnel who will be available to explain how their solutions can assist your mining operations, discuss the various service offerings they provide and assist with any visitor inquiries.